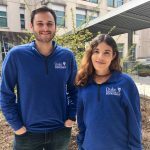 Three Nicholas School Alums, Max Leung PhD ’12, Ben Landis MEM’09, and Neil Matouka MEM’15, have joined forces to create a Duke Environment alumni group in the Sacramento, California area. 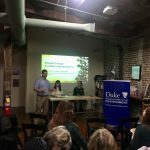 The emerging group, dubbed the “Duke Environment Club of Sacramento”, aims to foster a network where alumni can stay connected, share environmental insights, and serve as a resource for career advice to alumni and students alike. 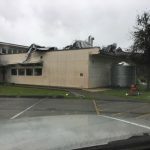 One of the group’s founders, Ben Landis, recently commented on how the Sacramento area would perfectly serve as a hub for which Nicholas School alums would flock. “There is a critical mass of [Duke Environment] alumni in our area, spanning graduates from the 1990’s to the 2010’s, working in many sectors and roles, from government to nonprofit, from field biology to communications. We all thought it was long overdue to create a local network for Nicholas School alumni and students to reach out to and find community with.” The group launched their first networking mixer in early October with the help of Glenda Lee, Director of Alumni Engagement at the Nicholas School, and the Office of Development and Alumni Relations. The event was held in collaboration with the local colleagues from the Yale FES alumni network and was attended by over 30 attendants, including 20 Duke alums and two prospective Nicholas School students. To help facilitate the group’s efforts, the three founders have created an email listserv which can be used to share job postings, collaboration ideas, events, and other announcements. The listserv currently has over 20 Duke alumni, including graduates from the Nicholas School, Duke Law, Duke Pratt School of Engineering, and Yale School of Forestry and Environmental Studies. 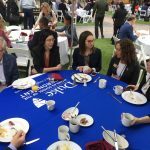 They also plan to link up with other like-minded alumni groups in the area, including those from UCSB, UC Davis, and UC Berkeley. Moving forward, the group aims to create more professional development opportunities for group members, including workshops where Nicholas alumni can share their skills and insights, and special events with notable guest speakers.